There is nothing worse than looking back at the kitchen after dinner and seeing a mountain of dishes piled high. That’s why easy, low-mess meals are king during the week when you’re being pulled in all directions at once. In honor of National Chicken Month and National Potato Month, we wanted to share our go-to weeknight meal for when you are in the mood for a filling, low-stress option. This sheet pan recipe requires minimal cleanup and will allow you to cross things off your to-do list while dinner bakes in the oven. An added bonus is that you can swap out ingredients with what you have on hand and use this as a formula for easy, sheet pan meals in the future. Consider swapping the green beans for asparagus or broccoli, and try covering the chicken in a tasty pesto or lemon-pepper seasoning for a new take on this dish. Preheat the oven to 425 degrees; wash and dry all produce. Cut potatoes into ½-inch cubes, chop rosemary and mince garlic; trim ends off green beans. Grab two sheet pans and line them both with foil. Toss potatoes on one sheet pan. Cover with a drizzle of olive oil and season with salt and pepper. Roast in oven until browned, tossing halfway through. About 20-25 minutes. On the second sheet pan, place chicken breasts and season with salt and pepper. In a small bowl combine rosemary, ¾ of the garlic and melted butter. Brush mixture on chicken evenly. Roast in oven until the chicken reaches 165 degrees, about 20-25 minutes depending on size and thickness. In a medium bowl, combine green beans, a small drizzle of olive oil, remaining garlic, salt and pepper. 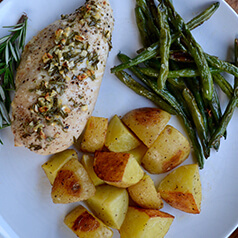 Add green beans to sheet pan with potatoes when there are 10-15 minutes remaining on the timer. Once chicken is fully cooked, allow it to rest briefly before serving. Divide up potatoes and green beans between plates and enjoy!